If you've ever clicked on my 'website' link in my menu bar, you may have seen the project I completed in 2012. 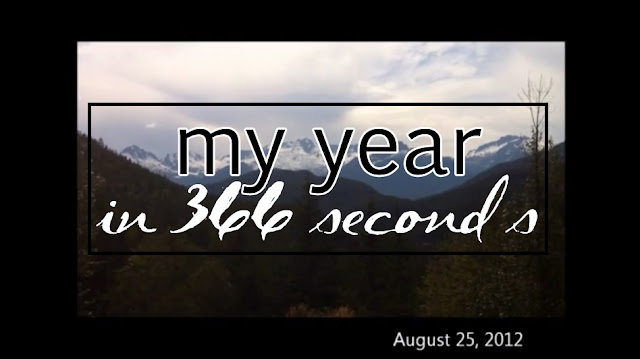 Each day I took one second of video (I took more than that and cut it down, actually) and at the end of the year I put them all together to create 365 seconds of video, one second for each day of my past year. If you haven't seen it, here it is - it ended up being longer than intended, but that is quite alright by me! A Year in 366 seconds from Jessica Hobin on Vimeo. February 21 - that is a sheep brain, not a human brain! April 29 - That is not a real gun. We had a 'most wanted' themed party, and my room-mate was giving a table-top speech (she does that). May 28 - I had my cat lion-shaved. She hated it. May 29 - I discovered film photography for the first time. Aug 24 - I flew to Vancouver for a few weeks, and it was amazing. Sep 4 - first day of classes as a real nursing student! Sep 28 - The axle broke on my car and the wheel did this. Thankfully we were in a parking lot when it happened. Oct 10 - my horse bit me in the face on thanksgiving. I don't know either, but it hurt. Nov 8 - a moustache party. I'm charlie Chaplin, not hitler (I promise). Dec 30 - I came down with the flu for new years eve, and, because my boyfriend's birthday is Dec 31, his birthday. Jan 8 - My friend from Australia visited and we put him in figure skates. Sorry, Haydn! This project seemed huge to me at the beginning. I started it after seeing "what Madeline did" (she's since deleted it, I think!) on a whim, not even on the first of January, and I didn't really expect to finish it. Yet as the year wore on, I was still pulling out my iPhone and capturing little moments in my days. It became a bit of a thing in my circle of friends - people would ask if they could be in it, and I captured a ton of amazing memories. I now watch it back fondly, and I was so, SO proud of myself for finishing it. I took a year off in 2013, but I've decided I'd like to do it again in 2014. If anyone would like to take this on and has any questions, please feel free to ask me in the comments. This was incredible and you've totally inspired me. I want to try to do this if for nothing else to try to capture more moments on film. I love looking back at old home movies and want to have more from this stage in my life. Thanks for the inspo! This is seriously awesome! I love that it's a way to look back on the year and remember a little bit of each day that you would probably normally forget. I'm going to have a huge life change coming up in a month so I definitely want to do something like this to document it :) Thanks for the inspiration! This is such an amazing idea! I would love to create my own video using this idea. This is awesome! such a cool project! You are so welcome! Glad I could inspire you :) I hope you give it a go! You should do it! You won't regret it :) It was a good year, but also a difficult year (lots of car troubles, as you may have noticed! haha). You should! Would be so neat to see kendalynn (did I spell that right? oops) grow over the year, too! With my perfectionist tendencies, I'd have to take five minutes of video so I could isolate the perfect 1-2 seconds to fit the sequence. :o) It would be a JOB! Love the video! Great idea! wow, what an awesome project! i love it! such a brilliant and inspirational idea which must have taken a lot of time and effort :) love that you used Imagine dragons for the music! Thanks, Alyson! I hope you decide to do it :) It was so much fun! I love this! Sometimes a video captures the moment better than a picture can, especially when it comes to things like hanging out with your friends and stuff. One of the best year recaps I've seen! (even if it was 2012.) I also love that I spotted some Catan and who doesn't love a dog riding a horse? I also love that a lot of the shots were just you looking at the camera kind of like, "Okay, what do I do today?" because it's true - not everyday is going to be an epic one. That's just how it goes!